St. Joseph Roman Catholic Church Cemetery, Geistown Borough, Johnstown, Cambria Co., PA 15904: Located on Bedford Street between (The Orchard Hotel) at 2434 Bedford Street and St. Benedict Roman Catholic Church at 2310 Bedford Street. 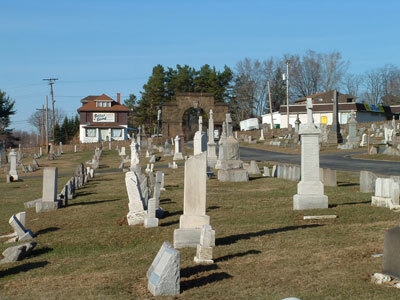 Geis Street is across from the large stone cemetery gate. (Bedford Street is Route # 56 as well.) Access to the cemetery is better gained from St. Benedict's parking lot. There is a mausoleum, four quadrants to the cemetery, and a flat new section as well. The parent church, St. Joseph, is in downtown Johnstown on 741 Railroad Street but currently under the administration of St. John Gualbert Cathedral at 117 Clinton Street. St. Joseph Church had been situated elsewhere before its present Railroad Street location. St. Benedict was formerly the mission church of St. Joseph parish.